Climbing Everest with supplemental oxygen has become standard for 97.1% of all climbers starting with Mallory and Irvine in 1924. As with all mountaineering technologies, oxygen systems have seen many changes but in 2013, there was perhaps a game changer that enabled several teams to enjoy record summit success. Climbers use supplemental oxygen to give them an edge while pushing to the summit of a mountain like Everest at 8850 meters. At that altitude, the available oxygen is 33% of that at sea level. It is like running up a staircase while holding your breath 2 out 3 steps. To summit Everest without using any supplemental oxygen anytime on the climb is rare, it is estimated less than 100 out of the over 6500 summits have been accomplished in this pure manner. Providing supplemental oxygen at 8000 meters in high winds and extreme temperatures is not simple. Valves freeze, masks deform in the wind, ice forms in tubes and many more problems prevent the delivery of the right amount of oxygen at the right time. Too much and there is waste of a precious gas, too little and a climber might die. The basic principle used by all systems is to transfer oxygen held in a metal cylinder usually carried in a backpack through a rubber tube to a mask covering the climber’s mouth and nose. An adjustable regulator attached to the top of the cylinder controls the oxygen flow to some type of reservoir where it is delivered as the climber inhales. A complicated valve prevents a climber’s exhale from going into the reservoir. In the early 1900s it was unknown if a human could live at extreme altitudes including climbing Everest. Serious efforts were made to design “breathing” systems but they were heavy, bulky and sometimes didn’t work. The original oxygen systems designed for climbing began with a device created by George Finch in 1922. Finch and his teammate Geoffrey Bruce reached an altitude on Everest of 27,250 ft (8175 m) setting a record using their open circuit system that weighed 33 pounds (15kg). One of the great debates on whether Mallory and Irvine summited in 1924 was around their oxygen system. Irvine was brought onto the expedition for, amongst other reasons, his expertise on these systems and modifications were made until they left for the summit. In the 1950’s when the Swiss and British restarted attempts on Everest, the technology had advanced based on two World Wars. In 1953, almost thirty years after the first attempts, Sir Edmund Hillary and Tenzing Norgay reached the summit with a much improved and lighter (22 lb/10 kg) system. In the 1960’s, more progress was made by Navy doctor and mountaineer Tom Hornbein who updated masks used by Navy pilots to be more efficient and easier to use. The appliance company, Maytag, produced a limited number of these masks for use in the 1963 America climb. One of the significant improvements was that the Hornbein mask had only one valve that prevented breathing back into the rubber bladder into which oxygen flowed from the tank so when the climber breathed, he took oxygen from the bladder, not directly from the tank. This made breathing easier and provided a steady supply of oxygen to the climber. The Hornbein mask design is still the basis for all masks used in mountaineering today. The Russian company, Poisk commercialized oxygen systems for climbers starting with an Everest expedition in 1982. Their mask was based on the Hornbein design. They manufactured small lightweight (7.7 lbs/3.5kg) gas cylinders made from titanium alloys covered in kevlar fibers holding another sealed container made of carbon fiber, fiberglass or organic fibers. In addition, they provided regulators that could be adjusted in 1/4 liter per minute increments up to 4 liters per minute. A climber could go for 6 hours with this system at 2 l/m. But this system was not perfect as I experienced on my first climb on Everest in 2002. In hindsight, I believe I climbed to the Balcony (27,200’/8250m) without supplemental oxygen due to the excessive leaking of the mask and perhaps some design issues.. The valve in the original mask design often allowed a climber’s exhale to enter the rubber reservoir preventing new oxygen from refilling the reservoir thus sending oxygen directly to the mask where it leaked out or was unused as the climber exhaled. This was often due to the valve freezing from the moisture in a climber’s breath. Poisk introduced a new line of masks to address these issues a couple of years ago. Some commercial operators took oxygen systems into their own hands. International Mountain Guides (IMG) began designing and contracting the manufacturing of their own cylinders in 1991 choosing a larger tank that would supply climbers with 10 hours of oxygen at 3 l/m. The Poisk system was the only game in town until the early 2000s when Ted Atkins introduce his TopOut mask. His approach was based on frustration with the Poisk mask. Atkins said the Poisk masks leaked, provided oxygen at a steady flow regardless of the needs of the climber, was uncomfortable and often froze in the harsh extreme of 8000 meter expeditions. Also, the Poisk mask continued to bring oxygen into the mask as the climber exhaled thus increasing the waste. The Topout mask aimed to solve those issue by using the equivalent of a plastic pop bottle as a reservoir. This allowed for a variable flow of oxygen as the climber’s efforts ranging from rest to extreme. Also, he designed an improved fitting mask based on 3M’s R-6311 respirator body. Once again, improvement is needed. On my descent from the summit of Everest in 2011, the tube going to my TopOut mask froze shutting off all oxygen to my mask. Of all places to occur, it was on the Hillary Step where I was exerting all my remaining strength to get down safely. Thankfully, my Sherpa, Kami, rushed to my aid as I reached the base of the Step and punched the frozen hose with a solid right fist. For 2013, he moved the flow indicator and controller from the regulator attached to the oxygen cylinder located in the climber’s pack, to an in-line device within the delivery tube allowing for easier adjusting and monitoring by the climber themselves. He also added a shorter tube connection to the bottle to address the freezing problems. Another UK company has been trying to break into the market for almost ten years. Neil Greenwood’s Summit Oxygen entered the market in 2003 with a true on-demand system that used tubes placed directly into a climber’s nostril, similar to a hospital environment. It was used then and today in military applications but the flow was not sufficient to meet the demands above 8000m for the typical Everest climber. They needed a system that provided more of a steady flow. Greenwood focused on the more traditional system for climbers with a more traditional mask, regulator and cylinder. He designed an entirely new system and has continued to make incremental improvements. They offered a complete system of cylinder, valve, regulator, and mask in the lightest weight system on the market. In 2013, several teams used the Summit Oxygen system with excellent success. Himalayan Experience, Himex, only used the Summit Oxygen mask and regulator as did Jagged Globe. While not attributing their perfect summit success record in 2013 to the Summit Oxygen mask and regulator, the companies give credit to the Summit Oxygen system. Guy Cotter, Adventure Consultants, had a good experience as he used a mix of TopOut and Summit Oxygen masks. He did experience a noisy valve and some dripping of the climber’s condensation down the front of their jacket causing zippers to get completely frozen up with the Summit Oxygen masks. ?Consistency of delivery of O2 was good in most cases. When we had a group on the same flow rate their bottles would empty at similar times (apart from the exception mentioned). Of course much of this is related to the amount of O2 in a bottle (which is variable) but we felt confident the regulators were delivering at a similar rate to each other. Inconsistent flow rate has been a major issue in the past with the old Poisk regulators and we’ve had to re calibrate them regularly.? ?So in general; the performance I would rate as very good, the durability overall was very good. There is still a way to go with the mask and the noise it makes and dripping issue. Regarding the Summit masks…this year I bought 15 of them to try out. They have a very small reservoir, so it does not get in the way as much as the TopOut reservoir does. The Summit design is robust, and we had no malfunctions or breakage. The main complaint with the Summit masks was that they are loud, with hissing/clicking sounds emanating from the valves with each breath. We did not have any problem with the Summit masks, so in that sense they were a factor in our success. But there were certainly a lot of other factors too…strong climbers, good weather, sweet route, etc! From my standpoint Ted Atkins (TopOut) has always been responsive, and he has been trying to improve his product over the years. I think the TopOut is a decent mask. Not perfect. Mainly, climbers just need to not be too rough with them. But, the Summit seems to be good mask too, and I may well some more of those. I used to use Top Out but these were a soft mask and so the various attachments kept falling off, and they were shoddily made. I had to do several adjustments myself in order to make them reliable at altitude. Plus the bottle on the trunk was a bit unwieldy. The Summit mask has a hard shell. By adding a hard shell on the outside of the soft shell gives more insulation, but also gives a solid placement for the various valves so they are secure and do not fall off. There is now a small diaphragm that takes the place of the hanging bottle and plastic bag system. Some say that this diaphragm is not large enough, but from my use we find that it is totally OK, even at a 4lt flow rate. Although this is somewhat more noisy, but when you have so much air passing a small place, one should expect this. Some of the valves are a bit tighter than the Top Out mask, at first this makes the Summit mask a bit claustrophobic, so it needs to be worn quite tightly in order to gain the full efficiency of the oxygen mix. But once on a 4lt flow rate it seems to work perfectly. Although we have not tested this in a laboratory, from all reports it seems that people are getting a better pure oxygen mix than previously. The Summit mask has an in line flow indicator, where as our Top Out masks did not have this feature, and to have it fitted was at an extra cost. I have been experimenting with several different models over the years. Certainly the “old” Poisk regulator was a great work horse and performed well. The “new” Poisk regulator was not as reliable and bits fell off, and the flow rate was not always accurate. These regulators served their purpose and are still good, however they do not have a relief valve, and they are normally noisy when screwing onto or off of a cylinder. We have had great success with some of the other regulators, but they are expensive and heavy. The Summit regulator is small, light weight and makes no noise when installing onto a cylinder. They have a very positive flow indicator that cannot be knocked accidentally in the pack, and there is also clear indication of the flow rate. However they must be turned on to at least 2lt flow rate when being installed or taken off of a cylinder otherwise you risk blowing the silicone seals. However, even if the seal has been broken, and so long as it has all been removed, it is still possible to use this regulator. I continue to use Poisk, some new and most of which have been refilled in India. I have never had a problem with these cylinders. Yes we get the occasional one that has leaked, but we know this before we take the cylinder up on the hill. In fact even new cylinders direct from Russia sometimes arrive empty, so we should all be aware that we need to weigh before taking cylinders above BC. I am happy with this combination of Summit mask and regulator, which have proved to be helpful with getting my members, guides and Sherpas to the summits of Manaslu, Everest, Lhotse and Nuptse. Some of our times have been fast on these summits, but I cannot say that it is just the mask and regulator that causes this, but I am sure that it is a help, it must also be considered along with an oxygen flow rate of 4lt per minute when on summit days. However you must also consider the fitness of my members, the weather conditions that they were going to the summit in, and the support and planning by the Sherpas at cylinder change points and the like. These factors cannot be underestimated, so really my warning is, just because you have the oxygen system, this does not mean that one will automatically reach 8,000m summits. Tom Briggs, Director at Jagged Globe said the masks and regulators performed well with zero problems. LOVED IT!!! No long ‘trunk’ to deal with. I used a new Summit Oxygen mask….it was lightweight, size small fit me very well, and it did not ice up as much as other masks I have used in the past.The new regulators are easier to use/see as well. Easier to see the dial, it has settings in 1/2 liter increments (I think)…but very easy to read and to put on and off of bottle. Easy to read gauge on the oxygen delivery tube too….. The system makes a slight ‘humming’ noise, but I did not notice that much…. I give it a double-thumbs-up!!! Summit Oxygen commented on the noisy valve saying it can be addressed during servicing of the masks. They will also be offering the mask in three sizes for 2014. Having a choice for oxygen system on 8000m mountains is good in that it the competition encourages manufactures to improve their product. There is no doubt that supplemental oxygen is one the key contributors in the hundred who summit Everest each season. But if something goes wrong it literally becomes a life and death matter. I expect to continue seeing Poisk, Topout and now Summit Oxygen used by multiple expeditions. Summit Oxygen has offered to let me use their system on Manaslu this Fall so I will update this article with my own experience after the climb. I successful used the complete Summit Oxygen (cylinder, regulator and mask) on my September 25, 2013 summit of Manaslu, 26,759 feet 8156 meters peak in Nepal. It was outstanding – the oxygen system I have ever used including Poisk or TopOut. 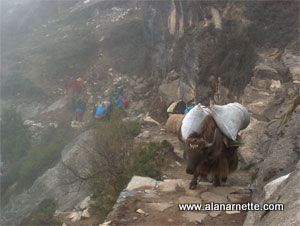 It was efficient and supplied steady oxygen throughout the climb. Most importantly, when needed in demanding moments, the extra oxygen was delivered quickly. There was a slight clicking sound but was not a factor while climbing. If I slept on my back it was quiet. The regulator design was excellent, easy to read and adjust – even without my glasses! The noise is a sign that the system is working isn’t it? So wouldn’t it be advantageous for the noise to be loud so the wearer knows the system is still functioning? Climbers usually know if the system is working – it is amazingly apparent 🙂 The noise issue has more to do with using O’s while trying to sleep just before and after the summit. Paul, thanks for your comment. On the initial batch of masks we supplied to the market we used a ‘step valve’ on the oxygen inlet side of the mask. This design of valve has a strong bias to the closed position which is great in one sense because it prevents any exhaled breath and more importantly the moisture carried in that breath to get back inside the oxygen reservoir which can cause serious problems if allowed to continue for hours in very low temperatures. The down side is that it can cause a small vibration which is the noise some members have experienced. I fully understand this could be an annoyance in the quiet of a tent when you’re trying to sleep. We have redesigned the valve and this eliminates the problem. This valve can be retro fit into our existing masks if required and will be used in all our masks in the future. Really interesting article, Alan. I’ve only ever used one type, which from your description I think must have been the TopOut. I had all sorts of problems with it and never could figure out how to use it reliably. When it worked it was great, but I suspect there were many times when I wasn’t getting the oxygen I should have been. Interested to see how you go with the new Summit system and will be following your Manaslu expedition closely. I find that in magazines and on other sites I skim over articles like this, but yours I read completely, as I do all of your posts. You seem to make even something as dry as oxygen mask comparisons seem interesting and an important, integrated part of a climb for ‘non-climbers’. It’s to your credit that those of us who will never put on an oxygen mask can find an article like this fascinating. This article was very educating. Your articles are always interesting to read.